Ultrasonography can play a significant role in the diagnosis and management of pediatric abdominal and scrotal disorders. This article will discuss the current imaging concepts with respect to 3 common pediatric abdominal emergencies: pyloric stenosis, intussusception, and appendicitis. In addition, the role of ultrasound in acute scrotal pathology in the pediatric population will also be presented. Pyloric stenosis (PS) is the most common surgical disorder that produces nonbilious emesis in infants. Pyloric stenosis is a developmental problem that is not seen at birth. Infants with pyloric stenosis can range in age from 1 week to 3 months, with most presenting at 6 to 8 weeks of age. 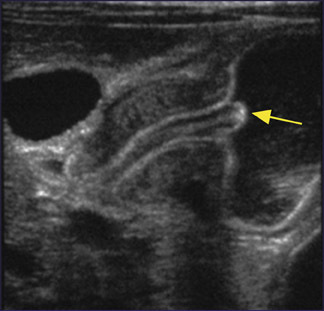 Pyloric stenosis is much more common in male infants; males outnumber females by 5 to 1. Pyloric stenosis may also be familial. 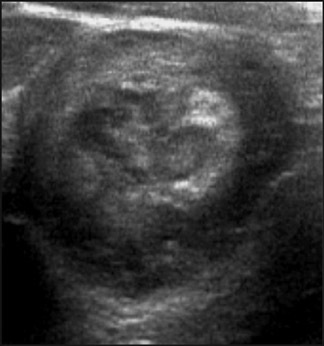 Sonography is the modality of choice in an infant who is suspected of having pyloric stenosis, with a reported sensitivity of >96%. 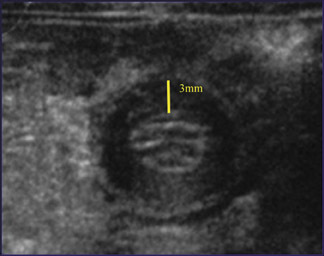 2 The advantages of sonography for this diagnosis are avoiding the use of ionizing radiation and directly visualizing the hypertrophied pyloric muscle. A high-frequency linear transducer (10 to 15 mHz) is typically used, as the stomach, pylorus, and duodenum are very superficial in an infant. The patient should be positioned in the right posterior oblique position, and the transducer is placed in the transverse plane in the right epigastric region. If the stomach is empty, sterile water can be fed to the patient by bottle to allow for the displacement of any interfering gas in the stomach and also to serve as an acoustical window. Overdistention, however, can lead to displacement of the pylorus posteriorly, which may hamper its visualization. Additionally, scanning the patient in the prone position may aid in visualization of the pyloric region in an infant in whom there is a lot of gas. As in the diagnosis of PS, a high-frequency (10 to 15 mHz) transducer is used as well as a small-parts algorithm, with focal zones set in the midfield and depth set for a large field of view. Scanning in both the longitudinal and transverse planes begins in the right lower quadrant and continues until the entire colon is scanned. Most of the time, intussuceptions are encountered in the right upper quadrant or at the level of the mid transverse colon. 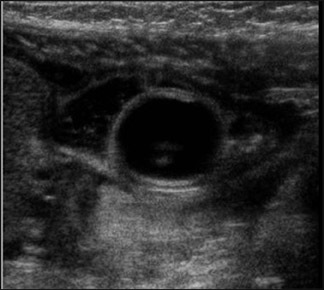 If the scan does not reveal an intussusception, a repeat scan using a probe with a larger field of view is suggested. The appearance of intussusception in the transverse plane is a large mass with a "swiss-roll" ap-pearance, representing the various layers of bowel, which are trapped in the pro-cess (Figure 4). The outer hypoechoic layer represents the intussuscipiens, and the hypoechoic inner layer represents the intussusceptum. In the longitudinal plane, the intussusception displays a "sandwich" sign (Figure 5). The center of the intussusception is hyperechoic, which represents the mesenteric fat that is pulled in. Additionally, mesenteric vessels within the center of the intussusception should be identified (Figure 6). 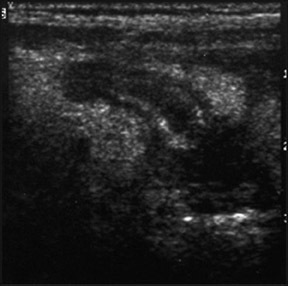 One may also see lymph nodes within the process (Figure 7). There are pitfalls in the sonographic diagnosis of intussusception. A thickened bowel wall may have the appearance of an intussusception, except that the central mesenteric fat and vessels are not present, which are essential to the diagnosis (Figure 9). The psoas muscle can also have the appearance of an intussusception in the transverse plane if the incorrect choice of transducers is made. 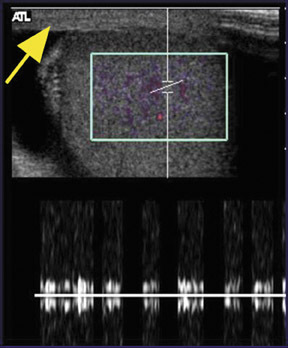 A false-negative diagnosis can be avoided by making sure that the field of view is not too small as to produce "tunnel vision." 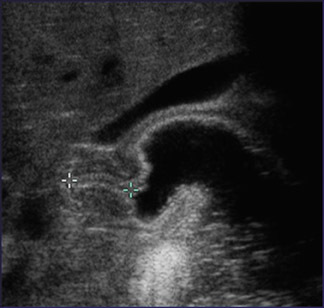 This pitfall can be avoided by rescanning with a curvilinear probe, if the initial scan with the high-frequency linear transducer appears to be normal. 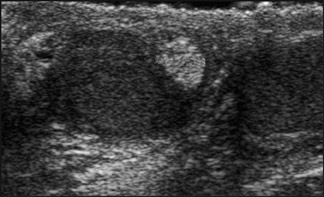 There has been much debate in the literature between the use of ultrasound or computed tomography (CT) in the de-tection of appendicitis. The decision as to which modality to use largely depends on the institution. In a recent meta-analysis that studied the accuracy of both modalities in >9000 pediatric patients, ultrasound was found to be nearly as sensitive and as specific as CT. 8 Some of the disadvantages of ultrasound are that it is operator-dependent, it requires patient cooperation, and the appendix may not be visualized if there is a lot of bowel gas present in the right lower quadrant. The major advantages of ultrasound are the lack of ionizing radiation and the speed with which the examination can be performed. In our institution, we start with sonography, and if positive, the patient goes to surgery. 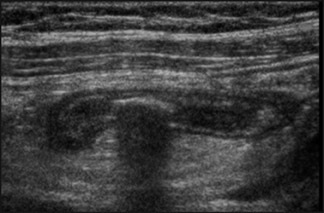 If the examination is negative or equivocal, the pediatric surgeons decide whether or not to observe the patient or to further evaluate with CT.
A sonogram performed for appendicitis requires a linear high-frequency transducer (10 to 15 mHz) and a field of view that is set so that the psoas muscle is clearly visualized. A graded compression technique is used and thus there is a gradual but steady pressure on the region examined with the transducer. The graded compression technique allows for the determination of compressible, normal appendix versus noncompressible, abnormal appendix. We find it useful to have the patient point with 1 finger to the area in pain and then first scan in that area. However, it has been advocated that a complete survey of the right lower quadrant be performed in searching for a normal or abnormal appendix. 9 Most often, the appendix is in the superior aspect of the pelvis, draped over the psoas muscle, or is retrocecal in position. The abnormal appendix is enlarged, measuring >6 mm in transverse diameter, noncompressible, blind-ending, and hyperemic. 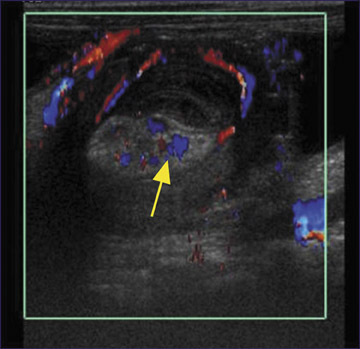 Ancillary sonographic findings consist of: heterogeneity of the surrounding periappendiceal fat secondary to inflammation (Figure 10), an appendicolith (Figure 11), free fluid (Figure 12), and a frank abscess in cases of perforation. Harmonic imaging has also been advocated for better delineation of the periappendiceal findings in appendicitis, especially in patients who are of less than optimal body habitus for sonography. 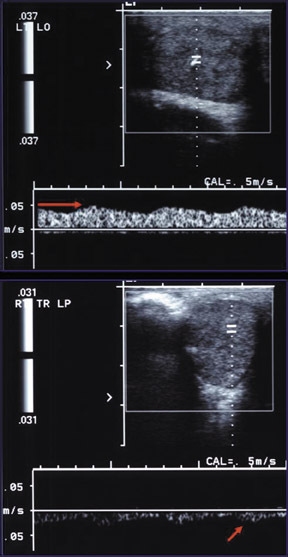 10 The best Doppler sonographic sign of appendiceal rupture is a hyperemic periappendiceal fluid collection. 11 Lymphadenopathy may also be present in cases of appendicitis, but is a nonspecific finding. The 3 most common entities that present in the pediatric patient with scrotal pain and swelling are: torsion of the appendix testis, testicular torsion, and epididymitis. Torsion of the appendix testis is the most common cause of scrotal pain in children. The etiology of a torsed ap-pendix testis is not known, but it is a self-limiting condition and does not require surgery. A normal appendix testis is generally not visible unless a hydrocele is present or it is torsed. As in all of scrotal imaging, a high-frequency transducer is used. In the transverse plane, a torsed appendix testis presents as a heterogeneous structure medial to the testicle (Figure 13). The torsed appendix generally has a "swiss cheese" appearance. Since the epididymis lies along the lateral surface of the testicle, a "Mickey Mouse" sign is produced when a torsed appendix is present (Figure 13). 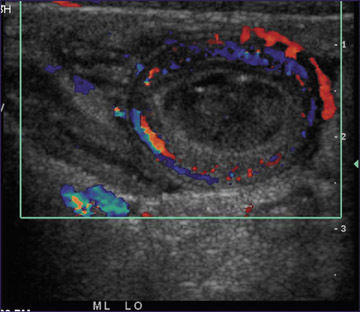 The epididymis and testis may also be enlarged and hyperemic; on color Doppler, the testis may resemble a detorsed testis. The key to the diagnosis is the visualization of the enlarged, avascular appendix testis. 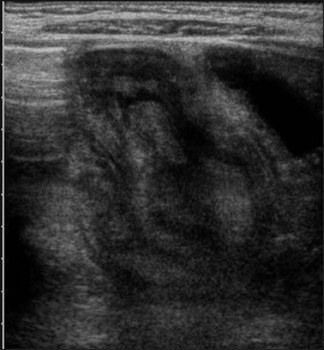 In subacute torsion, the appendix testis can become progressively echogenic, (Figure 14) calcify, or undergo resorption. There are 2 age peaks for testicular torsion in children: newborn and adolescence. There are 2 types of testicular torsion: extravaginal and intravaginal. With extravaginal torsion, which is more common in the neonate, the testicle, epididymis, vascular plexus, and tunica undergo torsion. With intravaginal torsion, which is most common in the adolescent, all of the intravaginal contents torse except for the tunica. 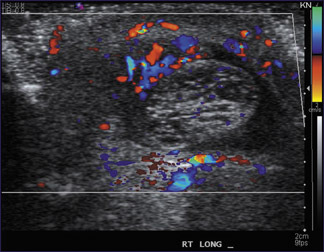 Sonography has a high sensitivity and specificity for testicular torsion in young children and adolescents. 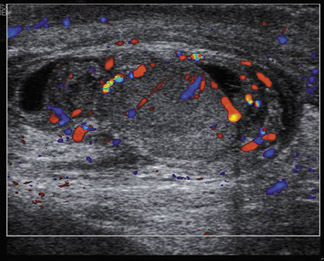 2 Color Doppler detection of blood flow to the neonatal testes may be difficult, even in a normal state. The gray-scale findings in testicular torsion depend on the duration of the torsed state. 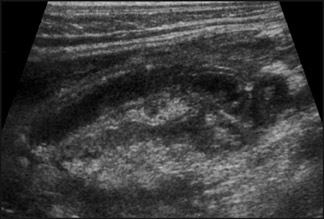 In early torsion, the abnormal testicle may have a normal appearance on gray-scale imaging (Figure 15). 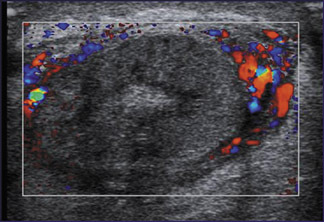 However, decreased or no blood flow to the torsed testicle will be found on color Doppler imaging. 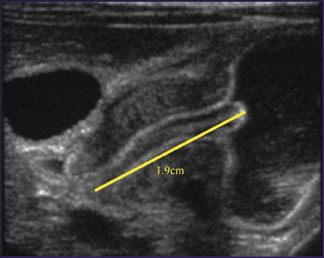 Ancillary signs of acute torsion include an abnormal position of the testicle (Figure 16), enlarged epididymis, reactive hydrocele, and scrotal skin thickening (Figure 17). After 4 to 6 hours, the torsed testicle is enlarged and hypoechoic because of edema. 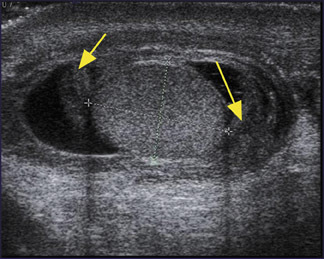 In late testicular torsion, the testicle is enlarged and heterogeneous because of hemorrhage, vascular congestion, and ischemia (Figure 18). The torsed testicle may undergo spontaneous detorsion. 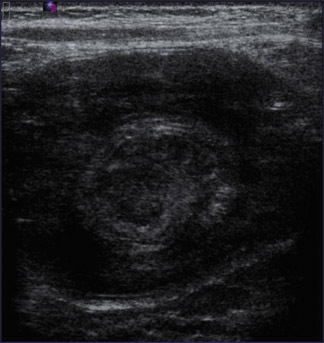 In such cases, color Doppler ultrasound will show a reactive hyperemia to the epididymis and testicle and may be indistguishable from epididymitis (Figure 19). Epididymitis represents an infectious inflammation of the epididymis and is most common in pubertal males. Prior to puberty, epididymitis may be the result of an ectopic ureter or from chronic bladder obstruction. We have had several cases of epididymitis in boys as a result of a recent history of trauma to the scrotum. In cases of epididymitis, gray-scale images will reveal an enlarged epididymis and testicle if there is con- comitant orchitis. 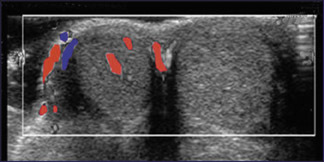 A reactive hydrocele and thickening of the scrotal wall and tunica may also be seen (Figure 20). 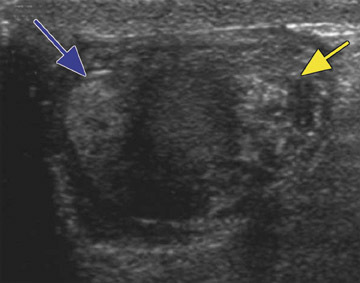 Color Doppler sonography reveals marked hyperemia to the epididymis (Figure 20). Sonography can play a vital role in the diagnosis of pediatric abdominal and scrotal emergencies. As sonography provides rapid diagnoses, without the use of ionizing radiation, it has become the "workhorse" of anyone involved with imaging of children. Ultrasound of pediatric abdominal and scrotal emergencies. Appl Radiol. Dr. Amodio is an Associate Professor of Radiology and Chief of Pediatric Radiology, SUNY Downstate Medical Center, Brooklyn, NY. Dr. Fefferman is a Section Chief in the Pediatric Radiology Department and an Assistant Professor of Radiology at New York University School of Medicine, New York, NY.